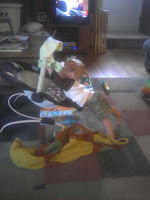 More evidence that you have to watch babies All.The.Time. 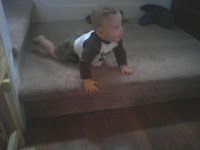 Since when does BB crawl up steps and pull himself into a standing position? Needless to say, there was some serious baby-proofing going on around our house this weekend. HAHA, he is going to be a handful!!! He's looking so big! I NEED TO SEE HIM!